We’ve been running PG Jobmon in our production databases at OmniTI for a while now and it’s been working very well. Found an issue with the monitoring function, polished some other features up and figured it was finally time to give it 1.0.0 stable once that was all fixed. Since my last post, I did get the simple job logging functions added that I mentioned (back in 0.4.0). To just simply log the number of rows affected by a single query call, you can use sql_step(job_id, action, sql). It returns a boolean to let you be able to test whether the step was successful or not. If you just want to log a single query as a complete job, you can use sql_job(job_name, sql). The result is similar to the simple step function, but makes an entire job log with the given name and a single step entry with how many rows were affected. The other big change that came with 1.0.0 is with the check_job_status() monitoring function. It now no longer requires an interval argument, and it’s recommended not to pass one unless you really need to. The thing that brought this change about was if you passed an interval smaller than the highest threshold value set in the job_check_config table, it could return some confusing results. I could’ve made it return a clearer result, but honestly it really makes no sense at all to pass a smaller interval than what you’ve set to be monitored for in the configuration table. So now it throws an error if you do so. And if you just use the version that takes no argument, it automatically gets the largest interval threshold you’ve configured and uses that. So if you get a new longer job to monitor in the future, you no longer have to update your monitoring processes to account for it as long as you use the no-argument version. The processes of monitoring for job problems has also been modified to allow check_job_status() to be able to raise notices when a job produces three level 2 (WARNING) alerts in a row as well. Previously this only happened with critical failures. The fail_job() function can now take an optional alert level argument to allow this to happen. This is useful for non-critical issues that, for example, shouldn’t cause a page to your oncall, but should still be looked into. For an example, see the next version of my Mimeo extension (>=0.9.0) that can send you a notification when a single replication batch has hit the configured row limit and may possibly cause replication to fall behind if it continues for too long. It’s an easily fixed problem and shouldn’t cause anyone to have to wake up in the middle of the night. I’ve been using this extension extensively with several other extensions I’ve been working on that really need a good monitoring process available to make sure they are working properly. The first, mentioned above, is called Mimeo, which does specialized, per-table replication between PostgreSQL databases. The other is PG Partman, a table partition manager for time & serial based partitioning. Both of these processes would be pretty useless without some way to easily let you know they are working right and provide an audit trail when something goes wrong and you’re not around. The autonomous step logging that PG Jobmon provides, without rolling back all the logged steps when something goes wrong, does this wonderfully. Yes that kind of monitoring could be built right into those extensions, but I’ve always liked the part of the Unix philosophy of doing one thing and doing it well and allowing those smaller powerful tools to work together to a greater affect. And we’ve found that having PG Jobmon available for any other functions we want to monitor very helpful since it’s not tied directly into the other extensions. Following up to my post last month about pg_jobmon’s logging capability, this post will discuss its ability to let you monitor your jobs’ statuses. Like last month, I will again be assuming you’ve installed pg_jobmon to the jobmon schema. I didn’t give it a strict ‘1 week’ interval just to give it a little buffer time. The above is what should be returned if everything is running fine. If not, the alert_text column will contain a list of all the jobs that returned either alert code 2 or 3. The alert_code field is the primary means of communicating the status of running jobs in the database. Use this in combination with the alert_code column in job_status_text to get a plaintext meaning to the code. As I noted last month, pg_jobmon uses three error codes to express the associated alert levels. The logger functions will use the alert_text values to update the status columns in job_log when a job is closed either successfully or failed. By default, any job that has failed to run 3 consecutive times will cause the above function to return alert_code 3. There’s no additional setup to do if that sort of monitoring will work for your situation. 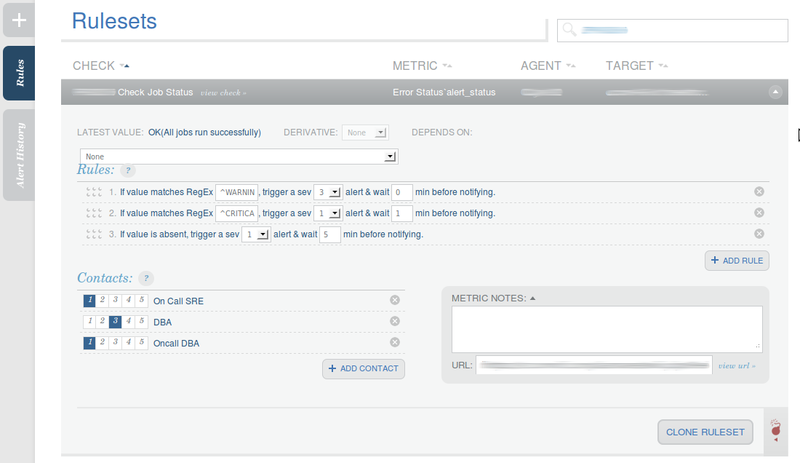 If you need any sort of alerting other than that, you can use the job_check_config table to set that up. Only one line needs to be added to this table for each job that needs different alerting criteria. 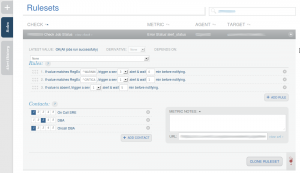 job_name – This is the EXACT job name as it appears in the job_log table. It is case sensitive, so jobs entered here should be in all caps. Easiest thing to do is just copy the job name right from the job_log table. sensitivity – This is the number of times the job can fail (status column in job_log is the text value of alert_code 3, CRITICAL by default) before alert_code 3 is returned by check_job_status(). Note that if you want this to return immediately on the first failure, set it to zero, not one. The threshold times use the end_time column value from the job_log table to determine when that job last ran successfully. That means a job will have to have run successfully at least once for check_job_status() to return an all clear. This is why the default value for active is false, to avoid accidentally setting off an alert for a new job you just added to the monitor. Here’s an example of one that runs once a day and should return alert 2 if not finished within 2 hours of its last run time and alert 3 if not run within 3 hours. Also a single failure of this job will cause the next run of check_job_status() to return alert_code 3 along with the failing job’s name. If you’ve used Nagios as your monitoring solution, the alert_text values probably looks familiar. This extension was designed initially for use in Nagios and kept its alert_text values from then. They seem to fit appropriately as defaults, and still work in our current monitoring software, so they were left like that. You’re free to update the job_status_text.alert_text values with whatever you wish, though, if your monitoring software needs something else. 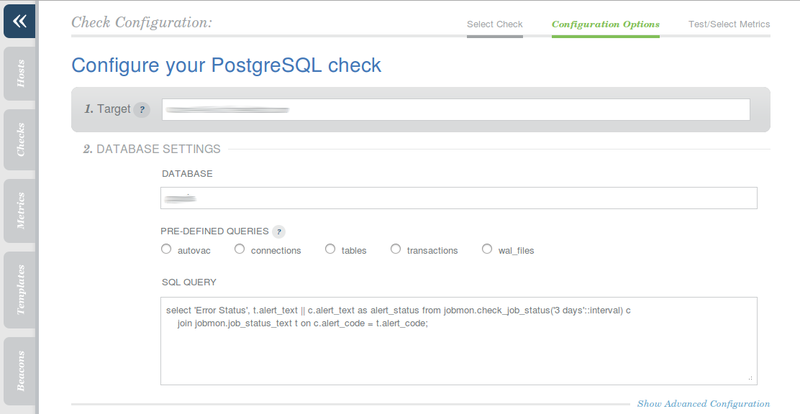 The easiest way to get pg_jobmon working with Nagios is to use the check_postgres monitoring script. 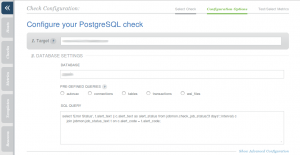 check_postgres has a custom_query option that works perfectly and already provides the output that Nagios needs. I’m not going to get into the finer details of configuring Nagios, but what follows are example command and service definitions that I’ve set up for my own system where Nagios and postgres run on the same machine. Adjust the paths and server values as needed for your systems. And then create a Rule using the regular expression matching options. In the above image, the last returned value shows the full text result of running the query. So if there are several jobs that have failed, they will all show up in the Circonus alert that is sent out. For us, Severity 3 just sends an email out to the DBA team, so we can try and fix things before actually setting a page off. Sev 1 alerts both our on-call DBA and the on-call Sys Admin. As I said before, the logging portion of this extension has been in existence for a while in several forms across different systems, so it’s pretty stable and probably won’t change too much in the near future. This extension is an attempt to bring some consistency and ease of maintenance across the systems we manage. The only thing I can see making a big impact in its design is if PostgreSQL actually gets built in autonomous functions. The monitoring portion is fairly new, and I’m hoping to find ways to make it more useful, but it seems to be working well so far in both the monitoring software packages I’ve tried it in. For either portion, I’m more than open to ideas and the code is always available for anyone to play with and contribute back.